Images in this post are from a trip to the Chilkat River Valley, outside Haines, Alaska. The Bald Eagle (Haliaeetus leucocephalus) featured in this post seems to be “stuck in a time warp”. 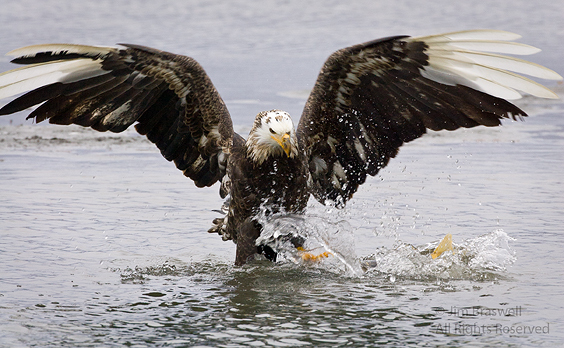 Bald eagles usually don’t develop their white heads and tails until their 4th or 5th year. 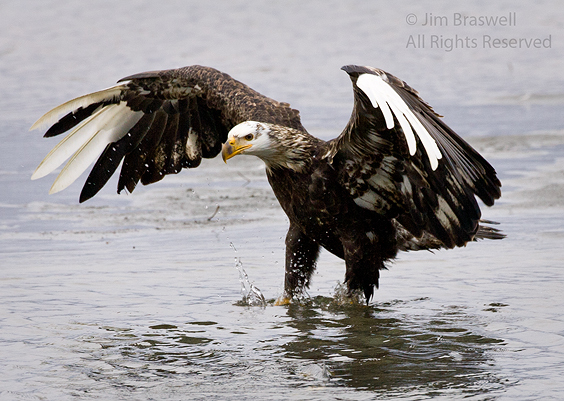 This eagle has a “half-developed” white head, but also has some white wing feathers, which is not typical. 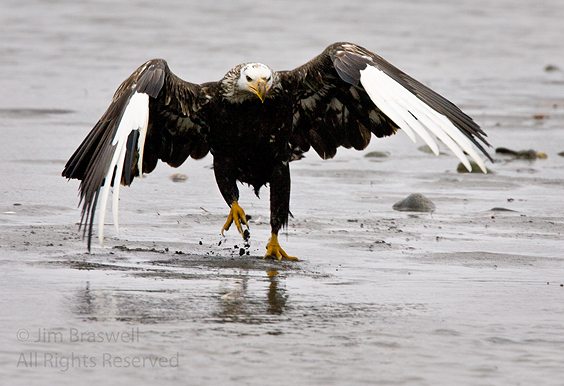 After shooting these images, I made a stop at the Bald Eagle Visitor’s Center in Haines. Talking to one of the volunteers there, I found out that this bald eagle also visited the Chilkat River Valley the year before my visit … and in the exact same plumage as I found him. This was confirmed by a photo taken the previous year and used in a photo calendar that was at the center. What causes this strange-looking eagle? Most likely, the eagle is “leucistic”. Leucism is a genetic mutation that prevents melanin and other pigments from being deposited normally on feathers, resulting in pale or muted colors on the entire bird. Albinistic (albino) birds have pink eyes because without melanin in the body, the only color in the eyes comes from the blood vessels behind the eyes. In the past, I frequently observed a leucistic red-tailed hawk that lived not far from my rural Missouri home, but I haven’t seen it for several years now, so it likely met it’s demise. Reminder: I will be presenting an informative program on the upcoming “Great American Eclipse in Missouri” tonight at the Harrisonville, MO branch of the Cass County Library. It is free of charge and starts at 6:00pm at the library. The first 75 attendees will receive free eclipse viewing glasses. If you live in the area, stop by and say “Hi”. 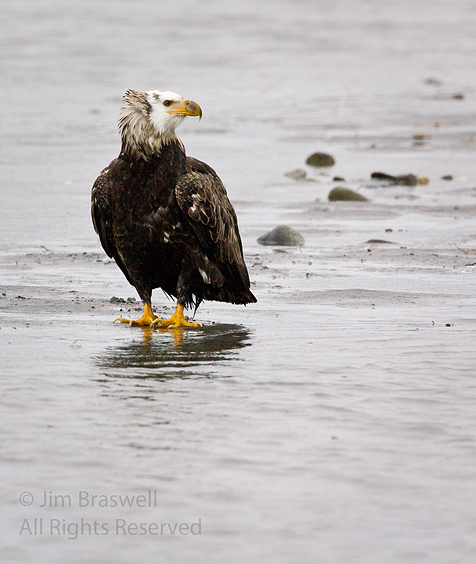 Tags: 2010, 2017, Alaska, Bald Eagle, behavior, bird photography, birding, birds, birdwatching, Blog, Inside Passage, leucism, nature, nature photography, photography, travel, winter.